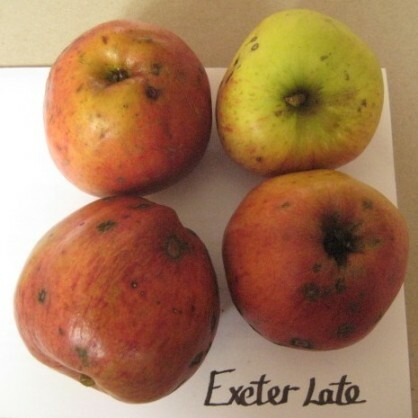 The Exeter area has a rich apple heritage with at least a dozen varieties of apple having strong Exeter associations. Some of these were bred by very notable horticulturalists and nurserymen. Sadly these varieties aren't generally considered commercially valuable and are in decline (along with orchards across the West Country). By making descriptions of these varieties more accessible, we hope to drive renewed interest and popularity. 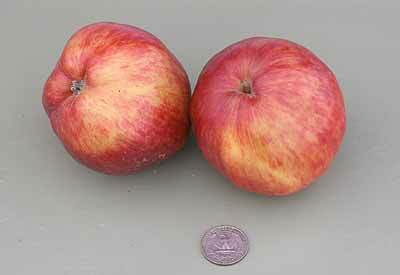 Type: Distinctively cerise multipurpose apple. Looks: Apples deep pink (cerise) all the way through (incl. flesh). Looks like Plum tree from a distance. 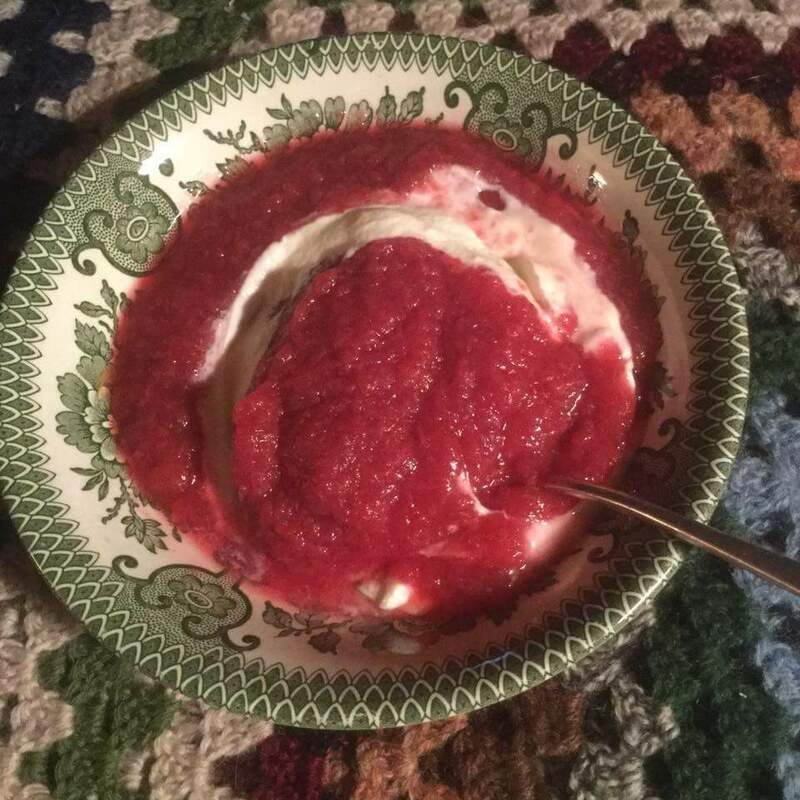 Flavour: Sharp - makes a very attractive coloured puree. Heritage: Rediscovered by Jane Schofield of Orchards Live. It was in an old orchard in Bradninch, now built on. The tree looked as if it was covered in black plums. I'd never seen anything like it, and went back to beg some scion wood when I'd learned to graft. It was down the road that has Bradninch Manor in it, but on the other side of the road. The tree was absolutely on it's last legs anyway. Looks: Normally described as large and attractive. Flavour: Soft, sweet and aromatic; slightly subacid with pleasant pineapple flavour. For ideal flavour harvest late and store a short while (perhaps a month). Heritage: A Cornish Gilliflower seedling raised, before 1920, in Exminster; common in Cornwall before WWII. Habit: Vigorous growth to moderate tree size; usually crops well, mid-late season. Looks: Medium sized scarlet/crimson shiny fruit. Flavour: Creamy, juicy, refreshing flesh; can be slightly aromatic or astringent. Heritage: Doesn't originate from Exeter, included here only because it bears the Exeter name. Bred by G.T. Spinks at the Long Ashton Research Station, Bristol, in 1924. A Worcester Pearmain and Beauty of Bath cross named in 1953. Habit: Prolific early cropper that's healthy and disease resistant. Type: Newly discovered very late season. Looks: Medium (eating) sized conical apples. Pale yellowy-green backs flecked scarlet flush covering most of surface. 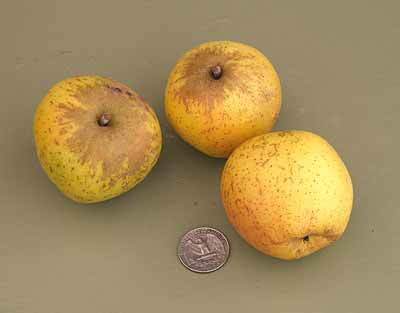 Hint of networked russet on some fruit, but dark indented pocks a more common feature. Some ribbing around closed calyx. Thick stubby stem keeps the apples on the tree throughout winter, which has bought this tree to notoriety (in national press). Flavour: Crisp, watery flesh. Quite chewy and fiberous without a great deal of flavour. Sampled early February (following freezing temperatures), which may have affected it. Heritage: Unsure whether this a chance seedling or a left-over from previous nursery (a nearby road named Old Nursery Drive). The tree, first reported in local media, is growing out of the railway sidings at a bridge over Summer Lane. Originally reported as "Alldoer", this now seems unlikely, as the original bred in mid-Devon and is not thought old enough to of propogated a tree of this age. Habit: Looks to be extremely hardy. Type: Multipurpose apple (can be a bit fine for juicing). Looks: Attractive large pale yellow/green with speckled rosy crimson flush. Quite lumpy with larger specimens tending to rib. Some russet adjacent stem, but not in calyx. Quite waxy to touch and light for size. Large open core with few pips. Flavour: Light, crisp, juicy flesh with a nice balance of sweetness and acidity for eating. Great from the tree, but doesn't keep. Heritage: Bred by Veitch & Sons, at their Exeter nurseries, c1880. The Veitch family were internationally acclaimed plant collectors and nurserymen who played a huge role in fostering the British love of horticulture. The business was founded by John Veitch, around 1800, at Budlake near Killerton (just North of Exeter). His son, James, expanded the business to a large site at Mount Radford, in Exeter, including a family home at Gras Lawn and Seed Warehouses in the City. By the 1850s, the business went on to gain interests in London; James (jnr) instigated the Royal Horticultural Society Fruit and Floral Committees and his Royal Exotic Nursery (Chelsea) became the largest of its kind in Europe. His heir, Harry, went on to launch the Chelsea Flower Show as well as compile references such as Veitch's Manual of Coniferae (1881) and Veitch's Manual of Orchidaceous Plants (1887-94). Meanwhile the Exeter business continued, moving to the more central New North Road in 1864 and finally to Alphington and Exminster in 1931. The annual RHS Veitch Memorial Medal remains one of the highest accolades in international horticulture. Habit: Good looking and very vigorous. Type: Rediscovered sharp cider apple. Heritage: The Killerton Estate (just North of Exeter) evidently has a long association with cider (although much of it only recently rediscovered). It was famously landscaped by John Veitch, in the late 18th Century, one of the greatest nurserymen and landscape designers of his day. For generations, the Veitch family were leading Plant Collectors and it was said that many a barrel of fine cider went out of the Topsham Quay in exchange for the best specimens. In the 1950s the estate passed to the National Trust and there was renewed interest when a number of unique, or previously lost, apple varieties were uncovered. By the 1990s the estate's orchards were again thriving and cider production was once again resumed using restored manual equipment. The Killerton Estate Medium Dry Cider was a Fine Farm Produce Award winner in 2006. Type: Rediscovered sweet cider apple. Type: Popular market town dessert apple (Eater). Looks: Pale yellowish-green skin with crimson streaks and dotted with dark spots. Quite large and angular with stout short-thick stalk. Flavour: Pleasant juicy white flesh with spicy, subacid flavour. Heritage: When Exeter was nort but a furzey down, Kirton [Crediton] was a thriving town. 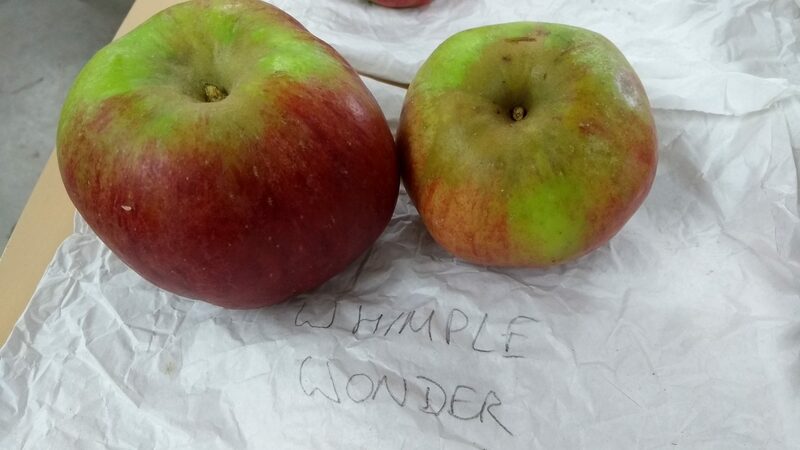 This apple is said to originate from the Lucombe & Pince nursery around 1831. This was located in the St. Thomas district of Exeter; see Lucombe's Pine for details. It seems it was most popular in Crediton, where it is known locally as Kirton Fair. It obviously does well at market as it was also grown in the 1920s in West Cornwall as the Newquay Prizetaker. Habit: Weak vigor. Mid to very late season fruiting. Looks: Medium (to small) sized, pale yellow and russeted with the finest tint of orange. Flavour: Rich, aromatic and sugary; pineapple-like. Highly regarded. Heritage: William Lucombe founded his nursery in the St. Thomas district of Exeter in 1720. He was a pioneer of hybridization, most famed for the Lucombe Oak (Quercus x hispanica 'Lucombeana'). These became popular Victorian symbols of status and many fine examples exist to this day. The nursery became Lucombe, Pince & Co. in the 1820s, run by Henry's grandson, Thomas, in partnership with Robert Pince. Their grand glasshouses became one of Exeter's great attractions featuring exotic palms and orchids as well as a fine fruit collection including carefully trained peaches and nectarines. The Lucombe's Pine variety of apple is said to date from around 1800, being an excellent example of their work. Incidentally, you can still visit the site of the original nursery, now Pinces Gardens; it retains a certain "Victorian feel" with an impressive 1880s Wisteria avenue. Habit: Very vigorous. Mid-late season. Type: Vintage sweet devon cider apple. Looks: Pale green with rosy scarlet flush tending to stripes. Dark speckled pitting (lenticels) on flush. Approaching medium size (small, but fairly big as cider apples go). Flavour: Produces a soft fruity cider with curious woody notes. Closely related to Slack-ma-Girdle - famed for cider making, but also its affect on the digestion. Heritage: Crediton area 18th Century. Popular throughout West Country. Habit: Strong vigor, with mid-season bloom and late fruiting season. Forms an open head with long limbs. Used as a frame builder in some areas. Type: Sharp cooking or cider apple. Heritage: Payhembury is NE of Exeter towards Whimple. Heritage: An old Veitch variety c1883. Heritage: From Broadclyst, early 20th Century. Type: Classic bittersweet cider apple (Drinker). Looks: Pale yellow (slight green tinge) with virtually no flush. Often considerable golden russet in cavity and networked over the cheek. Medium to large size; a little ribbed. Flavour: A melting mild bittersweet. Makes a rich, pleasantly aromatic, cider comparable with Dabinett. Heritage: Another fine apple heralding from the St. Thomas district of Exeter. It came to prominence in Devon at the beginning of the 18th Century; when cider formed part of farm labourers' wages. No doubt this contributed to its propogation and reputation as a fine old-fashioned bittersweet. Possibly an important link in the chain from the older Styre (Stiar) type apples, used in rough Devon Scrumpy, and more modern (Somerset) cider apples such as Dabinett and Kingston Black. It is also found in Somerset and Hereford where it may go by the name of Cadbury or Pounset. Habit: Similar to many pears in forming an upright, spreading tree of longevity; some susceptibility to scap. Mid season fruiting, although slow to crop - requires a favourable season. In Herefordshire it was noted as a good indicator of the season's overall apple productivity. Looks: Fairly small and appealing to children. Bright striped red flush dominates over yellow/green. Patchy russetting and sometimes a little spotty on the flush. Heritage: Raised by J Garland of Broadclyst nr Exeter around 1905. Type: Pure sweet cider apple. Looks: Medium sized, conical and predominantly yellow with the palest hint of green. Small smudged areas of bright pink/scarlet blush with dark spots. A little networked russet normally adjacent thick stem. Sometimes larger during light crops, also irregular king fruits common. Flavour: Soft, white flesh with no astringency; produces a pure sweet cider. Heritage: Exeter area, 18th Century; popular in Devon and Somerset. Often found in renovated orchards, usually planted as standards (rarely bushes). Habit: Precocious semi-spreading to large rounded head. Quite twiggy, bark of new growth has a golden sheen during winter. Slight scab and mildew susceptibility, but resistant to blight. Mid season flowering and fruit season; biennial tendency. Type: Dual-purpose; primarily an exhibition or dessert variety. Looks: An enormous handsome apple sometimes weighing over 1lb (½kg). Striking yellow/green to amber flecked with scarlet flush (tending to vertical streaks), no russet. Blossom also very attractive with profuse pink flowers. Stalk quite stubby. Flavour: Firm, coarse-textured, juicy flesh with a somewhat acid but fair flavour; aromatic with a hint of pineapple. Cooks well to a puree and can be stored into New Year. The fruit has been described: "Of very distinct flavour and likely to become popular." Heritage: Raised by George Pyne of Topsham and introduced in 1910. A village north of Exeter is called Upton Pyne, it may be the George was from this village or there may be some other connection. Specimens were exhibited at the Royal Horticulture Society in 1933 where it was described as being similar in shape to Royal Jubilee, and with colour typical of Lane's Prince Albert, i.e. yellow with scarlet flush and streaks. Eye closed in a wrinkled basin; stem short, stout. No russet in cavity. Flesh white, juicy and fairly firm. Habit: Upright growth of medium vigor. Pollination Group 3; usually in full flower by second week of May. Mid season fruiting (Sept/Oct). Type: A well-bred eater that combines the best of many popular varieties. Looks: Medium-large lightly russeted fruit. Appears quite brown from a distance, close up a strong green blends into light brown russet then a dark mauve flush. Very attractive networked russet patterns around calyx. Flavour: Shares the qualities of a russet and sharper culinary apples. Flesh quite chewy and heavy textured like Egremont Russet, but less muddy and sharper along the lines of Granny Smith. Heritage: Bred by Veitch & Sons Exeter nursery in 19th Century, it gets a mention in the letters page of Cassell's Illustrated Family Paper, June 1865. Clearly carefully selected to be a more attractive looking russet, combining the best of popular eating varieties. The light russeting is less rough in the mouth than a full russet, yet the nutty flavour comes through. The size fits the hand well and the apples are very classically shaped (for eating). Heritage: Another Killerton variety. Note this is a local cider variety, not Dumelow's Seedling (that sometimes goes by the synonym Wellington). 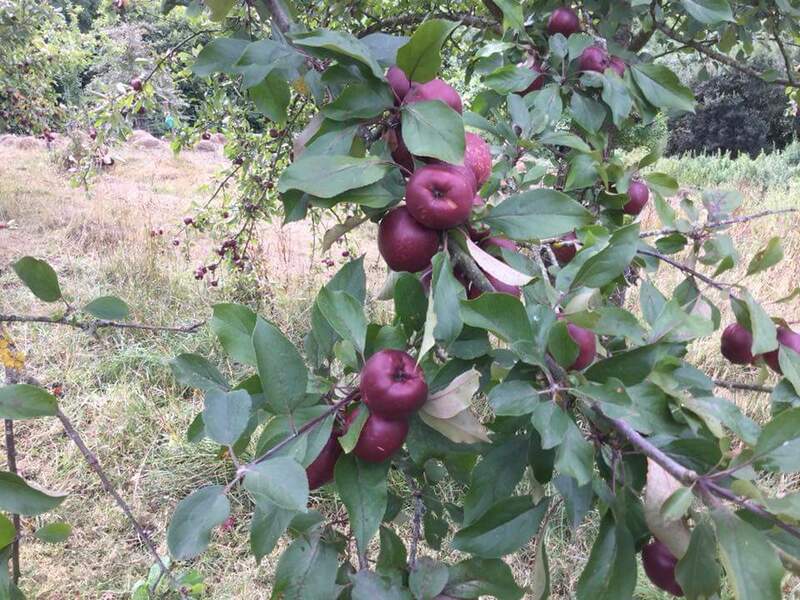 Heritage: Grown as part of extensive Whiteway's cider orchards. Last tree found in garden of new houses. Propagated and promoted by Whimple History Society. Habit: Similar to Bramley, but with less vigor. Heritage: Presumably from the Alphington district of Exeter. Habit: A big heavy cropping tree. Heritage: Known to be from Exeter. In case you were wondering, Pomona is the goddess of fruit trees, gardens and orchards (associated with abundance, blossom and the harvest). This name has a long history of being used by fruit reference books. For example, George Brookshaw's publication of 1812, Pomona Britanica: A collection of the most esteemed fruits. More recent examples include The Northern Pomona: Apples for Cool Climates and A Somerset Pomona: The Cider Apples of Somerset. Unlike these, this Online Pomona is not really an original work, but merely a collection of information available elsewhere. Please feel free to contact us if you have additional information that you would like added.